Little bouquets of white flowers dangle in a cluster from your ears. They remind me of Lily of the Valley flowers. 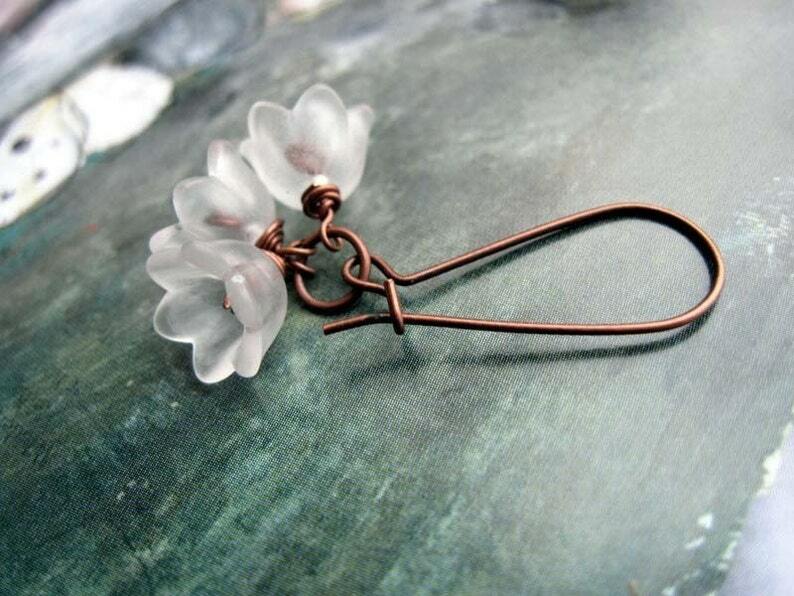 I created these sweet Summer earrings with 3 acrylic bell flowers in matte white dangling from a medium size copper kidney wire. The flowers have a slight transparency to them. These Spring earrings are super light in weight and measure 1 1/2 inches long. The photo showing me holding them is in yellow and modeled in pink. Another great pair of earrings with an appreciated tweak to the wire color. All done so quickly. Thank you for your prompt turnaround to me!! Thank you for careful and prompt shipment! I love these! Very pretty! Thank you! Beautiful and elegant. These arrived quickly and were exactly as described. Great service and communication with owner. Will definitely shop here again.